It’s almost breathtaking how fast Internet bandwidth needs have mushroomed. Just yesterday 10 Mbps was considered high speed broadband. Today it’s more like 100 Mbps for even medium size offices. If your businesses is involved in video production, heavy use of cloud applications, software delivery or has lots of employees or customers, Gigabit Internet speeds are no longer a luxury. Fortunately, they’re easy to come by. The beauty of fiber is that it is future proof. The fiber in the ground today will support the bandwidths of tomorrow. 1 Gbps today. 10 Gbps next year. 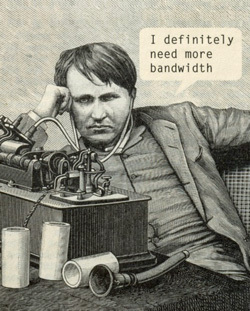 Perhaps 100 Gbps in the coming years. The preferred technology is Ethernet over Fiber. This is the same Ethernet that you run now on your local area network. Most NICs (Network Interface Card) are 10/100/1000 Mbps. With CAT5E or CAT6 wiring and Gigabit switches, you are perfectly matched to access the Internet as fast as your network will run. Ethernet over Fiber replaces SONET, an older technology that requires specific interfaces for different service levels. Ethernet over Fiber is different. Your LAN supports equipment running at different speeds. So do Ethernet Internet connections. More importantly, you can install fiber with an Gigabit Ethernet edge router and order any speed service you want. Typical service levels vary from 10 Mbps to 1 Gbps. You pay less for lower speed service if you don’t need the full GigE bandwidth. When you do, upgrading is just a phone call or control panel adjustment away. Cable has come a long way from its early days of low speeds and spotty performance. That’s thanks to the deployment of HFC (Hybrid Fiber Cable) systems that have fiber optic cabling for the core of the network. Only the drop to your building is still coaxial cable. The other big improvement has been the development of DOCSIS 3.0 modems good to 1 Gbps and the newer DOCSIS 3.1 modems good to 10 Gbps. With cable broadband capable of 10 Gbps performance, what’s the incentive to install fiber? In many cases, the real incentive is to stick with cable. It offers the advantages of much lower cost, triple-play options that include broadband, phone and television, and fast installation. As long as your business is near the cable run, you can be hooked up quickly and easily with little or no installation cost. Cable speeds rival fiber and your connection to the cable modem is standard Ethernet. Yet, the cost per month is a fraction of what you pay for equivalent fiber performance. What’s the catch? There are some differences in service, which may or may not make any difference to your business. First, cable bandwidth is shared among users, not dedicated to your exclusive use the way fiber is. You may notice that your Internet speed varies throughout the day. Most of the heavy use is for consumer video streaming, though, and that occurs mostly in the evening. Cable bandwidth is also asymmetrical. In other words, you get 1 Gbps download but perhaps 100 Mbps upload. That matches the needs of most Internet access, but can be a problem if you often transfer large files to other locations or upload large files to servers or cloud applications. 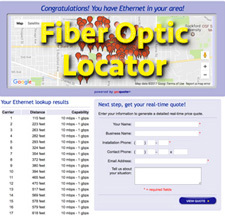 Fiber services may offer the option of point to point connections between business locations. Cable broadband connects you to the Internet. However, you can set up a VPN between locations connected to the Internet and achieve secure point to point connectivity… at a much lower cost than dedicated fiber connections. Which Gigabit Option to Choose? it should be noted that many cable companies will now offer you access to their core fiber networks as well as coaxial cable broadband. Cable fiber is the same high performance network as other Ethernet over Fiber providers. That includes bandwidth that is scalable, dedicated and symmetrical. Compare Gigabit bandwidth options and see which service most closely matches your business needs.